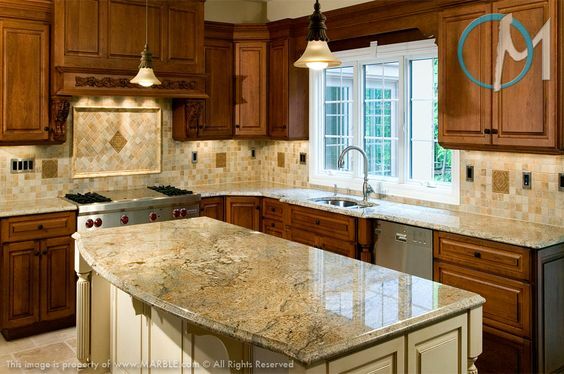 A beautiful slab of granite can really create an amazing focal point for your kitchen and dining room. That’s because the beautiful colors attract attention and definitely make things look more beautiful than plain colors or laminate. 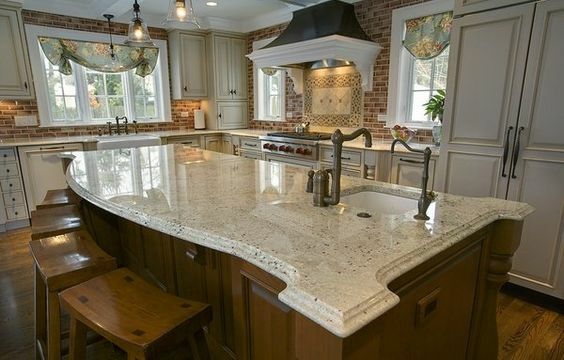 With Bianco Romano Granite you’re getting something beautiful and high quality at the same time. 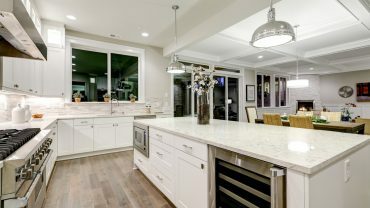 What is Bianco Romano Granite? 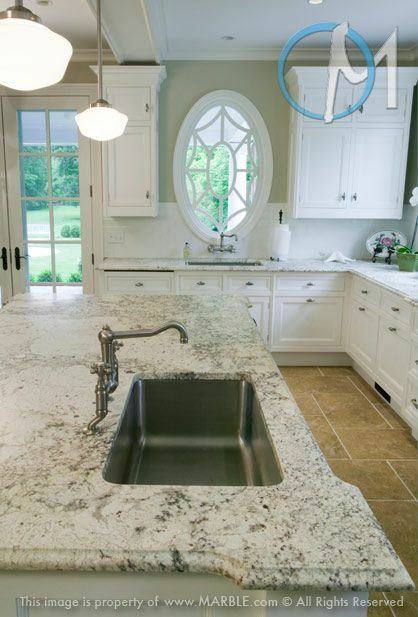 Bianco Romano Granite is a beautiful white block of solid and durable granite. It’s not pure white, however, because it has flecks through it. These flecks could be black, brown or gray and may be large or small. You may also see some veining through the slab, which is when you get lines and spider web style patterns. 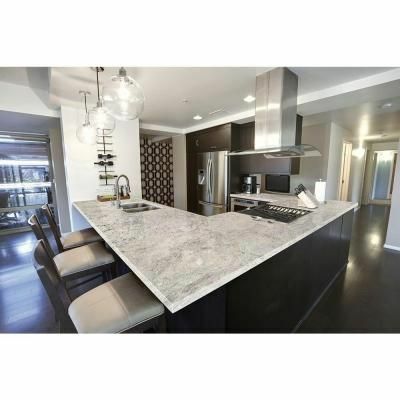 This granite is definitely a beautiful one and tends to work great with different colors of cabinets and styles of kitchens. You can dress it up to get a great, elegant style or you can dress it down for something less formal. 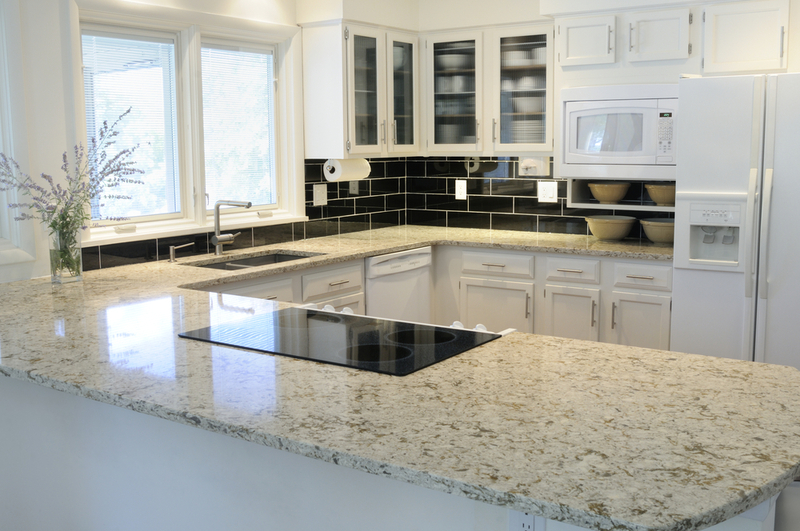 A lot of people love this granite because of the variety of uses you have. They love that it really works with just about anything. They also love that it’s not as expensive as some other forms of granite or countertop. 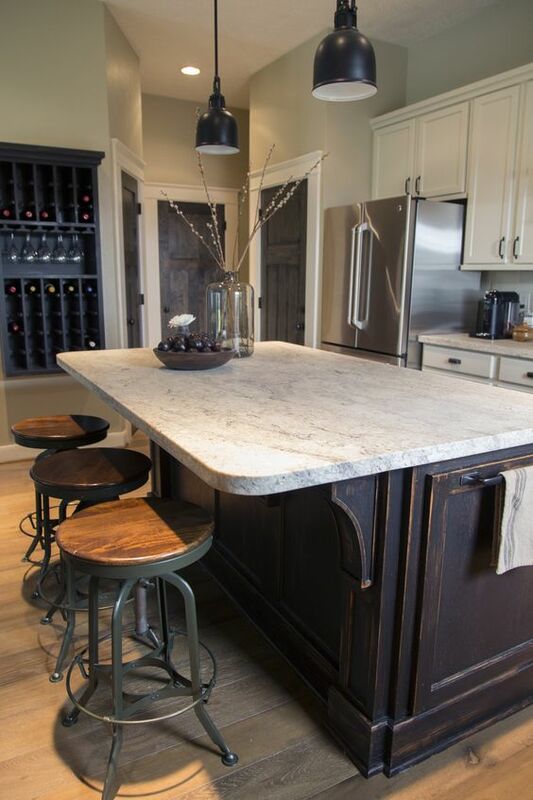 This gorgeous style of granite is actually priced at only $35 a square foot. And that’s only if you want the thicker slabs. For thinner slabs you’ll be paying somewhere around only $20-$30 per square foot. What all this means is you can get a really nice looking piece of granite without having to spend a lot of money. 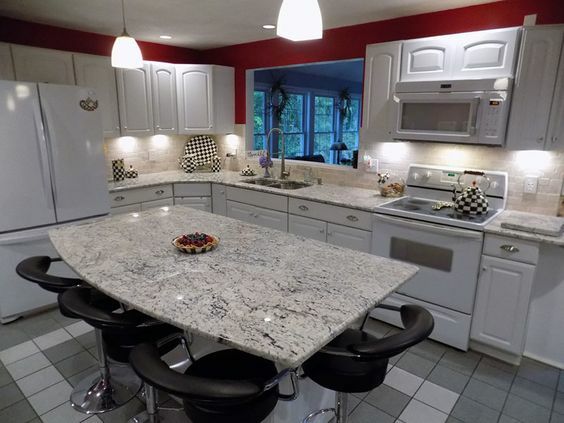 Another great thing about this style of granite is that it’s one of the best white granite colors around. It also looks a lot like marble, but is extremely sturdy and durable. It doesn’t scratch or crack under even more strenuous use and it’s made to look just as good a long time from now as it does right this minute. The only thing is that you need to get it sealed properly to make sure of this. The exact design of your kitchen is going to be entirely up to you. 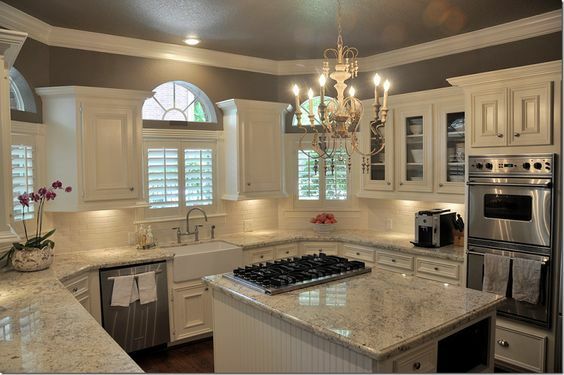 You always get to choose the style and arrangement of your cabinets and you get to choose the colors as well. With this type of granite you also get to choose the exact slab that you want. After all, any natural material is going to be slightly different from one slab to the next. With the options we’ve found we tried to look at a range of different kitchen ideas. You’ll be able to choose which one works best for you and also which works well for your family. You want a kitchen that reflects your personal style, whether that’s formal or casual or something in between. Make sure you look for an option that seems to show just that. Of course, you may decide that one of these isn’t your usual style but it’s still something you just have to have. And you may decide to tweak one of these options to your own fit, but no matter what you’ll have something unique. 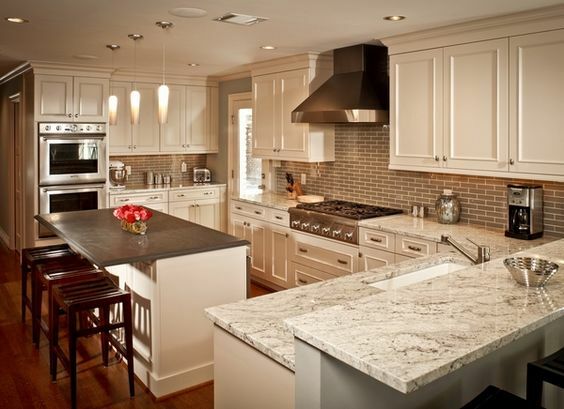 The white cabinets with a lighter slab of the Bianco Romano granite definitely give a more calm feel to the room. Just a little gray and other color through the slab highlights the gray in the upper portion of the walls. 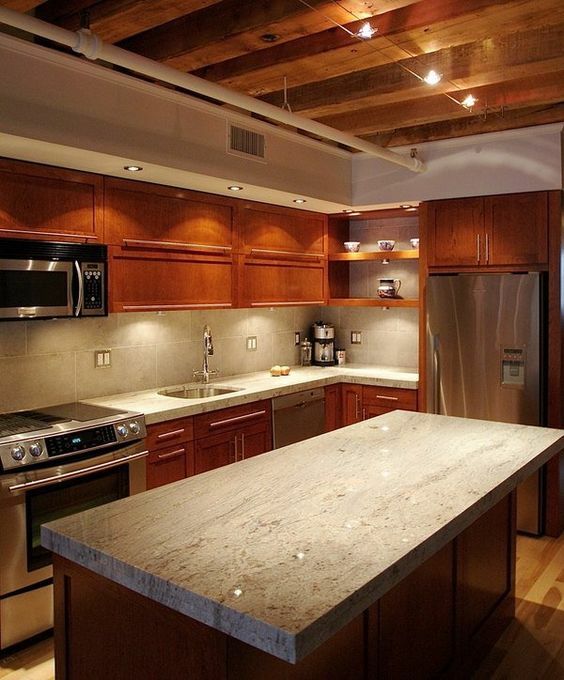 Here the cabinets are actually relatively basic, but the slab, especially on the island, helps liven things up. You get a really elegant feel from the cut of the piece both the edge and the overall shape. A little bit of lighter wood to go with the granite can be a fun accent with these white cabinets behind. For this one it seems to emphasize the white colors in this particular slab. This kitchen has some unique aspects going on with the granite because the island is entirely different from the rest. That gray though really seems to emphasize the gray colors in the rest of the Bianco Romano granite. 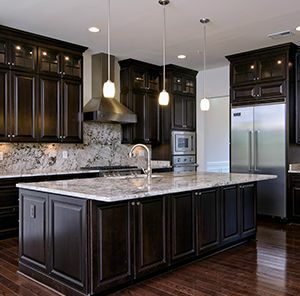 The dark wood of this island looks great topped with a thick slab of granite. It also helps to downplay the elegance of the piece as well with its own rustic appearance. 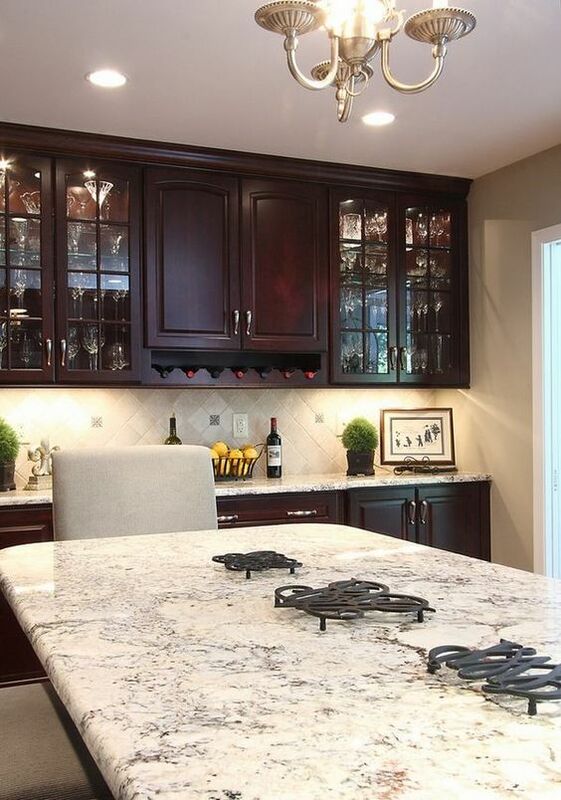 Moderate color to these cabinets works well with a darker slab of this granite. It helps draw out the browns and other colors that really make this a beautiful and unique piece. Here we have a thick and beautiful slab of Bianco Romano granite to go along with some gorgeous dark cherry cabinets. It all looks very elegant and decorative with just a small amount of color through the white background. The wood ceiling and cabinets in this kitchen are beautiful on their own but it’s the granite that really makes everything look its best. This slab on the island is definitely thick and heavy and the sharp edges and corners create a more rustic look to finish it off. 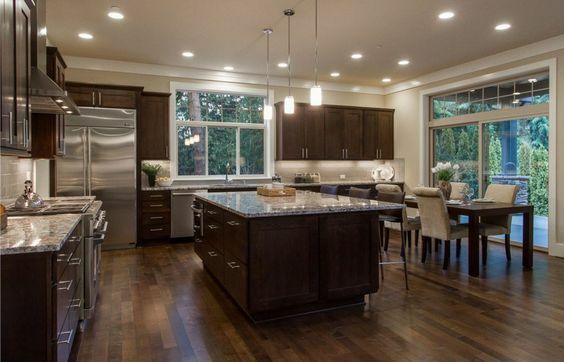 Dark wood works really well with a lighter piece of granite countertop. Not to mention the continuation all the way up the wall makes it super stylish and a great look for any home. This slab of granite definitely emphasizes the white coloring but it looks great with the dark cabinetry to go along with it. It’s all square corners and a little bit of shading, but definitely something beautiful. This is a darker brown cabinet but with a darker floor to go along with it. 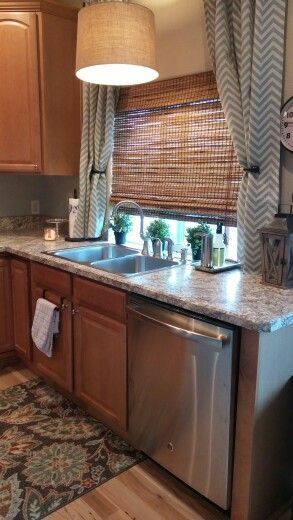 That definitely creates a great look with the granite countertops and helps lighten up the space. Too much white sometimes feels overwhelming, but this piece of granite makes the kitchen look more formal without a whole lot of extra money. The white appliances can save you some and the white cabinets are basic, but the granite table and counters create a ritzy feel. Honey cabinets with a beveled edge countertop are stylish but still simple. You don’t have to dress up your kitchen to look expensive if you don’t want to, even with granite.